By now, your baby will be approximately 29cm in length (remember that we are now stating length from crown to heel, rather than crown to rump), and he or she weighs about 501g. 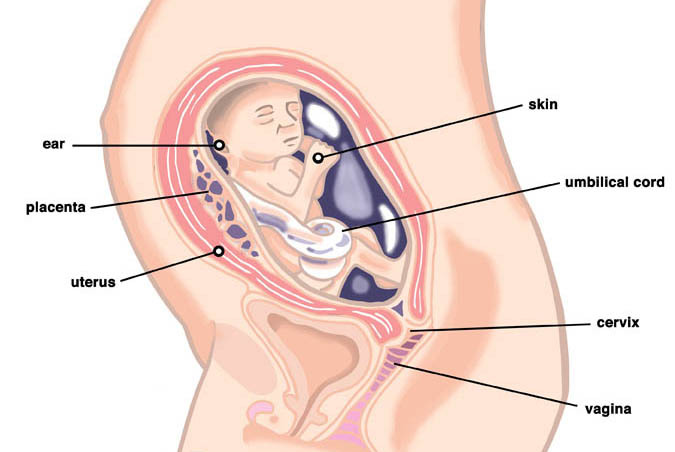 The skin on the baby is still relatively transparent, although by now it is redder in colour, owing to the development of the blood veins and arteries below the surface. It also appears to be a little bit saggy, this is because the skin itself is currently out-growing the body fat, but this body fat is about to start increasing rapidly and the baby's skin will soon fill out. The baby's hearing is improving all the time; every day they will be becoming more familiar with your voice and other external sounds, although the sounds from inside your body, such as the rushing of blood, the beating of your heart and the sounds from your digestive system, will still dominate their world. You may find that your belly button, once a beautiful and round indentation in your tummy, has begun to protrude - or it may just be flat. This is perfectly normal; in fact nearly all women experience this at some point during pregnancy, and most find that it returns to normal not long after the baby is born. It is also likely to have stretched, so don't be concerned if it seems much larger than it used to. If you experience any pain in your belly button area then contact your GP. You may find that the skin in and around your belly button (or maybe all over your tummy and possibly around the sides of your breasts) has begun to itch. This is likely to be due to the rapid stretching of the skin which can leave it dehydrated. Make sure that you continue to drink plenty of water, avoid hot baths and showers which can make your skin dry, and apply moisturiser regularly. Unscented moisturiser is sensible seeing as your skin can be quite sensitive at this time. If the itching develops from, or into, a rash of any description then seek advice from your GP or midwife. If you travel in a car a lot then you may find that wearing a seatbelt is uncomfortable or that it makes you feel vulnerable. Many women worry about the lower part of the belt suddenly tightening into your tummy in the event of an accident. Wearing a seatbelt is the law when travelling in the UK, because it is the safest way to travel - pregnant or not - so don't take it off. Make sure that the lap part of the seatbelt is tucked under your bump. If you do have an accident and the belt tightens, it is not likely to cause any damage to your baby as the amniotic fluid and uterine muscles are very well designed shock absorbers. It is possible to purchase an accessory which helps to fasten the lower part of your belt across your lap and keep it away from your tummy, many women find that they are more comfortable using one of these so look into them if you are having problems, especially if you travel a lot with work. The upper part of your seatbelt should be worn as normal, across your body (not tucked under one arm), between your breasts and down the side of your bump. The other concern about driving is air bags. When deployed, they will come into contact with the driver (or passenger) with considerable speed and force, so it is advisable to check that you are driving with at least 25cm gap between yourself and the steering wheel. If possible, angle the wheel upwards so that the bulk of the airbag will be sent towards your face rather than your tummy area. Page generated in 1.4384 seconds.